By their nature – cryptocurrency nodes are append only databases. This means the storage requirements for the node will always be increasing in direct correlation to the number of transactions processed per second. As the popularity of cryptocurrency increases over the next few years – we will see a huge increase in the storage requirements for running these nodes. In December 2017, the size of the Bitcoin ledger is 149 gigabytes and this is predicted to grow exponentially into Terabytes of data over the coming years as more and more payments are made as adoption increases. This will increase in direct correlation to the number of nodes you run in parallel – each will need their own writable copy of the ledger and if you are running at any kind of scale (hundreds or even thousands of nodes) – the storage requirements become an operational issue. Compare this to mutable systems where values are replaced and you can see that as we go forward in time – we start to suffer from the ever growing ledger size. There are ways to prune the ledger size but it is a growing concern that in a few years the size of these ledgers will grow beyond the reasonable size of available disks. In a traditional cloud based application – where you might be using a database such as Cassandra – it would be possible to add new nodes to the cluster and as such, increase your storage capacity to solve this problem. However – blockchain systems are databases and as such it is not an option to simply use a distributed database as the underlying storage mechanism. Put simply, we need a solution that allows us to grow our storage capacity without affecting performance or having to perform migrations that will mean down-time. 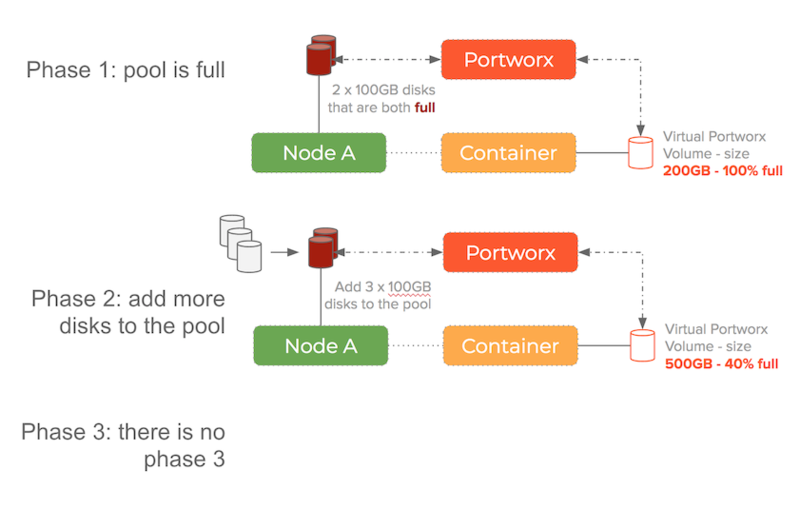 Portworx takes a different approach to the traditional approach of connecting a single disk to a container – it pools the underlying disk drives into a storage fabric. 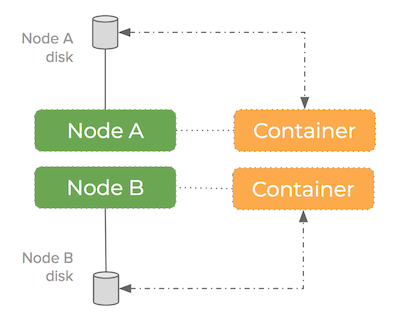 This setup means containers get virtual slices of the underlying storage pool on demand. It is able to replicate data to multiple nodes and work alongside schedulers such as Kubernetes to ensure containers and data converge efficiently. Imagine you have a 1TB disk and your dataset is using 99% of that disk. A one percent increase in your dataset leads to a dreaded disk is full message. This normally results in having to add a larger disk to the node, bringing down the existing container and then switching it to use the new, larger disk. You also have the problem that the new disk is empty meaning the cryptocurrency node would have to re-download the entire ledger – which can take some time and that means prolonged downtime for your service. The other solution is to copy the contents of the old disk onto the new disk and whilst being faster – would still require downtime and introduces operational complexity that could be avoided if using Portworx. Think of this as having 2 boxes for stuff – one is X big and the other is 2X big. As we add stuff to the first smaller box – we are filling it up. Because each box is entirely seperate from the other – once the smaller box is full, we would have to take all the stuff out of the first box, put it into the second and then continue filling up the second box. You then have another problem – what if the ledger size for a cryptocurrency node starts to become larger than the capacity of any of your disks? 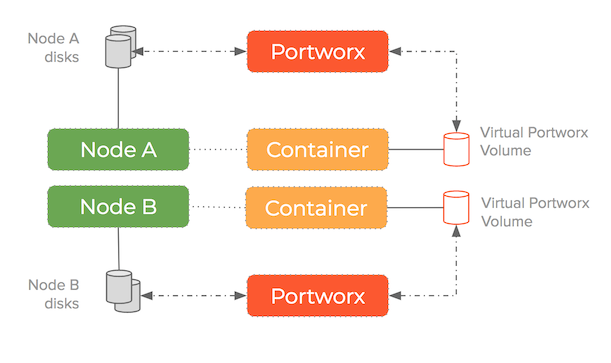 Because Portworx decouples storage from containers – it means we have a software defined storage fabric sat in between the container itself and the underlying storage resources. Back to our storage in a box example – we now have a funnel we can put stuff into that is aware of how full each box is and intelligently put it into a box that has the space. From a logical perspective – we have one very large box – we don’t have to worry about what box is full and what box we should put the next thing into. The clever funnel does this for us. Portworx does exactly this but for data and disks – it is able to route writes to any of the underlying storage devices but still present a logical volume to a container that is comprised of a combination of all these disks. The container just sees a massive disk! 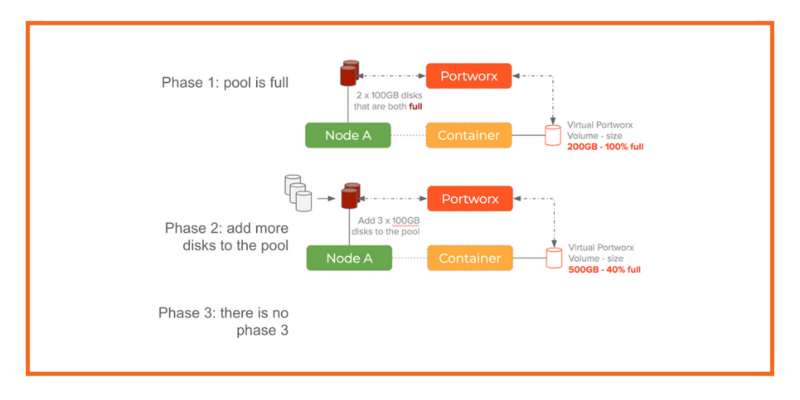 These operations become simple using pxctl – the command line tool that manages a Portworx cluster. 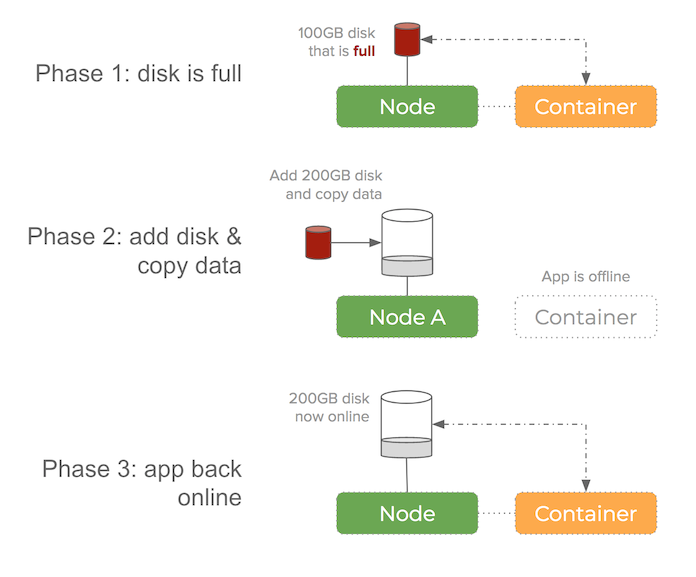 In both cases – without restarting containers, you can grow the size of a container volume and add devices to the underlying storage pool. This vastly simplifies the operational complexity of running a storage intensize cluster which becomes especially useful for cryptocurrency nodes. The ability to have a container volume that is larger than any of your physical disks is literally impossible without using some kind of Software Defined Storage solution and Portworx is the leader in it’s field with many customers running in production. As cryptocurrencies gain adoption – the storage challenges we see today will only grow exponentially. It’s important to get the foundation of your system solid before the real challenge of global usage arrives. Be sure to download and try Portworx today so you can see how it works and get a feel for the product – it’s free to try for 30 days!